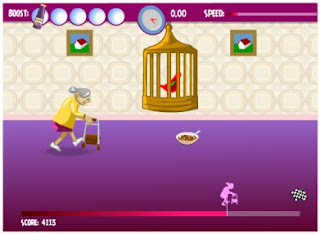 To celebrate the launch of our new racing grannies 'Gran Prix' game, we're giving away a fantastic Sony PSP. To be in with a chance of winning this fantastic prize, just play our Gran Prix racing grannies game and post your score on the leader board! The player with the highest score at the end of May 2007 will win the PSP! It's free to play and you can have unlimited attempts to reach the top spot! What are you waiting for? Click here to play 'Gran Prix' ! Anyone can enter this competition, so why not forward this blog post to your friends and family??? Competition closing date: midnight 31st May 2007. This competition is open to residents of the UK aged 18 and over. Employees or persons connected with Studio or Findel PLC are ineligible for this competition. The winner of this competition will win a Sony PlayStation Portable PSP Console. There is no cash alternative. The prize will be awarded to the person who achieves the highest score on the Studio Gran Prix game leader board by midnight on 31st May 2007. In the event of two or more players achieving an equal high score, the winning entries will be pooled and a prize winner selected at random. The decision of Studio is final and no correspondence will be entered into. Studio cannot accept responsibility for any technical problems or malfunction of any servers, networks or computer systems in relation to this competition. The competition winner will be notified by email within 7 days of the closing date. Studio reserves the right to use the name of the winner in any post-competition publicity. Studio is a division of Express Gifts Limited. Registered in England, Company no. 718151 (London). Registered Office: Burley House, Bradford Road, Burley in Wharfedale, West Yorkshire, LS29 7DZ.